This page is the result of a compilation of all centroid moment tensors computed for the Italian region for the entire period of availability of digital seismographic data, e.g. 1977 to present. 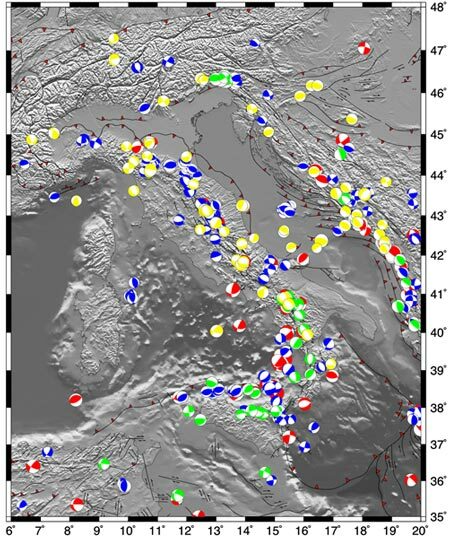 In addition, the RCMTs computed for the NE Italy, Friuli, 1976 seismic sequence are included (Pondrelli et al., 2001). In the map, red solutions are from the Global CMT Catalog, blue solutions are from the European-Mediterranean RCMT Catalog, green solutions are from previous papers and yellow solutions are from Pondrelli et al., 2006. We merge the existing global CMTs and European-Mediterranean RCMTs data for the Italian region with those computed to extend backward the Euro-Mediterranean RCMT catalog (Pondrelli et al., 2006). We obtain a wide dataset covering the 1976-to-present period, nearly 40 years of seismic activity. All together we have more than 650 centroid moment tensors, for shallow and intermediate depth earthquakes, with magnitude between 4.0 to 6.9. Some of these moment tensor solutions are already included in the Global CMT Catalog. But surface waves at regional distance (inverted to compute RCMTs) have a better signal-to-noise ratio than long period body or mantle waves at global distance (inverted to compute CMTs), and the RCMT method appears more appropriate for modelling smaller magnitude seismic sources. Therefore, when both solutions exist for an earthquake, we choose the RCMT when Mw < 5.5, and the CMT solution otherwise. Pondrelli, S., S. Salimbeni, G. Ekström, A. Morelli, P. Gasperini and G. Vannucci, 2006, The Italian CMT dataset from 1977 to the present, Phys. Earth Planet. Int., doi:10.1016/j.pepi.2006.07.008,159/3-4, pp. 286-303. Pondrelli, S., G. Ekström, and A. Morelli, 2001, Seismotectonic re-evaluation of the 1976 Friuli, Italy, seismic sequence, J. Seismol., 5, 73-83.